This made us smile. Gummy Style..
Well the little master continues to sell. It never ceases to amaze us how Gummybear aka Gummibar continues to sit there and in fact dance around the top 10 of the UK’s most downloaded dance music video charts. He is really giving Eric Prydz, “Call on Me” a run for his money. Just goes to show how much those kids love to download the video of Gummybear and dance along with him. Come and talk to us about merchandising opportunities conerning Gummybear. Just Dance Kids 2 is Available Now… And The Gummy Bear Song is on it..
Ubisoft video game Just Dance Kids 2 hit stores this week and it features The Gummybear Song! It is available for Nintendo Wii, Playstation Move for the Playstation 3, and Kinect for Microsoft XBox 360. Just Dance Kids 2 features more than 40 new songs, including today’s hottest hits, such as “Love Me,” “Whip My Hair,” “Just The Way You Are,” and popular songs from kids’ favorite TV shows and movies. In addition, the game includes mixes of classic kids songs like “Head, Shoulders, Knees and Toes” and “The Hokey Cokey” in several languages. Just Dance Kids 2 takes full advantage of each motion control platform, providing each with a unique feature and experience for the player. The Kinect for Xbox 360 version of Just Dance Kids 2 will allow kids to play without using a controller, star in their own music videos, and create and save their own dance routines to challenge friends and family members. With the PlayStation Move, kids have the ability to capture their cool dance moves with the PlayStation Eye, which snaps photos of players while dancing. In addition, kids can select their favorite song medleys. The Wii version of Just Dance Kids 2 features a brand-new multiplayer mode called Balloon Pop, which lets kids shake their Wii Remote™ controllers to earn more points and have more fun while dancing. All three platforms feature a brand-new game feature called Nonstop Shuffle, where players can play the game for designated periods of time of 15, 30, 60 or 120 minutes without having to push any buttons or navigate through menus for non-stop play. Further exciting Gummybear news will be hitting the market soon and companies interested in licensing merchandise rights for Gummy should contact AT New Media. AT New Media Announces First UK Gummy Bear Apparel Deal! Digital licensing specialist AT New Media, licensing agent for the smash-hit internet phenomenon Gummy Bear, has announced details of a new agreement with Fashion UK that will see the company launch a fantastic range of Gummy Bear branded apparel onto the UK market. Gummy Bear (aka Gummibär) is the all-singing, all-dancing icon that has been one of the standout digital hits of recent years. The multi-lingual crooner can sing in eleven different languages and this has led to a monumental international following, making him a huge superstar on the Web, with fans watching Gummy Bear content through sites such as YouTube and MySpace and via a dedicated web presence at www.gummibar.net. Breakthrough hit The Gummy Bear Song has been downloaded an astonishing one billion times and Gummy Bear videos are a constant presence in the top 10 of the iTunes Dance Music Video Chart. The brand is already well established in southern, central and eastern Europe, where licensed merchandise is flying off the shelves, and the property enjoys considerable success in the promotional sector, with companies such as Turkish telephone giant BN Telecom, Greek food manufacturer Ifantis and McDonald’s in Germany all having seen huge increases in sales through associating with Gummy Bear. AT New Media is looking to capitalise on the property’s huge popularity in theUKand the new agreement represents the first Gummy Bear apparel deal in this country. Fashion UK will develop a range of branded products that is set to include a hooded top featuring the famous Gummy Bear ears. It is also hoped it will link in to the promotion of the new Just Dance Kids video game which uses the Gummybear song not only within its portfolio of tracks, but in media promotion of the game. Why not come and see AT New Media at Brand Licensing in London in October to discuss how you can move with Gummybear aka Gummibar…. Gummybear continues to be a massive video hit…..
Just in case potential merchandise licensees in the UK needed further evidence of the continuing performance of Gummybear, here is a screenshot from today’s Top 10 Dance Music Video download charts on iTunes. With more exciting announcements coming soon, anyone interested in this fantastic character, whether for merchandising or licensed promotions, should make sure they come and see AT New Media at the Brand Licensing Show in London next month. 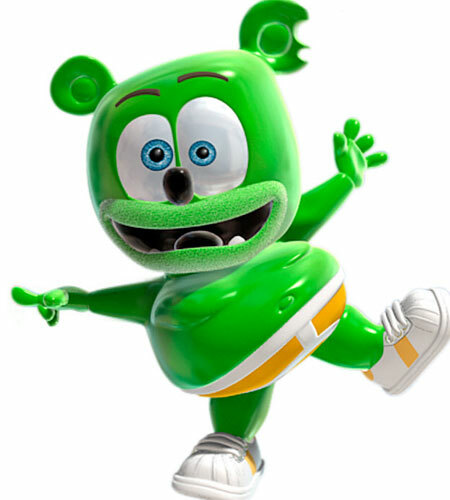 Digital specialist AT New Media, licensing agent for the smash-hit internet phenomenon Gummy Bear, has revealed that Turkish telecoms provider BN Telecom is enjoying huge success with a new promotional campaign featuring the character. Gummy Bear (aka Gummibär) is the all-singing, all-dancing icon that has been one of the standout digital hits of recent years. The multi-lingual crooner can sing in eleven different languages and this has led to a monumental international following, making him a huge superstar on the Web, with fans watching Gummy Bear content through sites such as YouTube and MySpace and via a dedicated web presence at www.gummibar.net. Breakthrough hit The Gummy Bear Song has been downloaded an astonishing one billion times and Gummy Bear videos are a consistent presence in the top 5 of the iTunes Dance Music Video Chart. The brand is already well established in southern, central and eastern Europe, where licensed merchandise is flying off the shelves, and has a large and growing fanbase in the UK. BN Telecom is using Gummy Bear to promote its directory enquiries service, which has led to a surge in usage and also had the knock-on effect of boosting sales of Gummy Bear products throughout Turkey. This is the latest in a series of successful European promotions to feature the brand – commercial partners such as Ifantis, a major food brand inGreece, and McDonald’s in Germany have seen huge increases in sales through associating with Gummy Bear. AT New Media is currently looking to extend the brand’s commercial potential into the UK and has taken on promotional marketing expert Richard Pink of Pink Key Consulting to help facilitate this. They still love it out there… Join in the craze and get merchandising. We noted this below, however, we thought it deserved more prominence. Yes the “I Am a Gummy Bear” music video CONTINUES to be massive in the iTunes Music Video Dance chart and online. Yes it is true. Call on Me (Eric Prydz), Who’s that Chick (Guetta & Rihanna), Just Dance (Lady Gaga), and Satisfaction (Benny Benassi). Come on you merch licensees, get with the music craze which continues. This is Gummybear aka Gummibar!